A note about our helmet selection: When we first started, Bauer and CCM only had 2-3 helmet models making it rather easy for us to keep necessary product and sizing on our shelves. Today, both companies have expanded their selection to between 7 and 8 models each (and 3 to 4 sizes for each model). This has made it very difficult to maintain an adequate selection of products for our customers - especially since each model seems to be geared towards a slightly different head shape. What does this mean? Well, to be blunt, we have made the decision to stop stocking helmets. This was not an option we chose lightly since our goal has always been to provide affordable ice hockey referee equipment, but when looking at the bigger picture, most local proshops will already carry black helmets unlike the extremely thin pickings of referee specific gear. 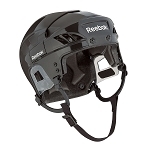 Our sales indicate that most referees have been purchasing helmets locally as well. Still need a helmet that you cannot find locally? We will be more than happy to order your desired helmet from Bauer or CCM (typically, this will take about a week to arrive). To make a request, please either email [email protected] or call us at 877-333-7335.